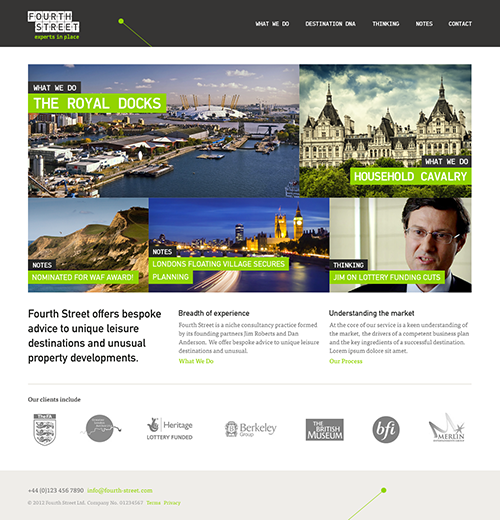 Fourth Street provide strategic and commercial advice to unique destinations and unusual property developments. 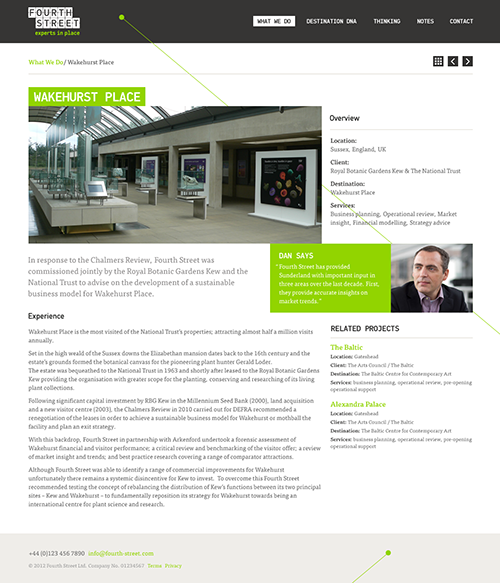 They are management consultants that specialise in placemaking and destination development. 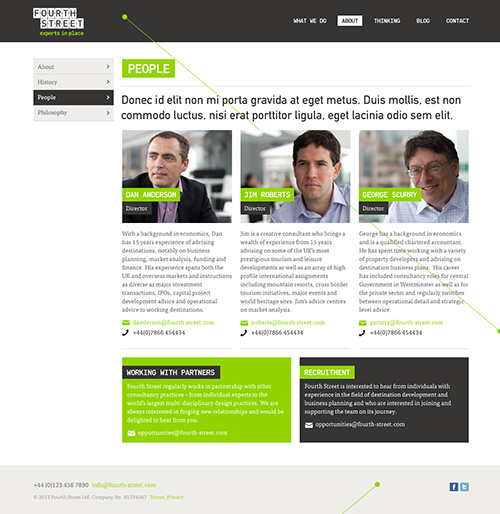 After working on their new logo and and wider brand rollout with Tangerine, Fourth Street set us the brief of designing a clean and simple website to exhibit their broad depth of expertise, showcase their considerable range of projects and reflect their fresh approach to destination development. Fourth Street are old friends of Supereight so it was an absolute pleasure to work with them. Visually, we took a lead from their simple, bold logo style and created something very graphic that uses simple colour and typography to compliment the photographic elements used throughout the site. We feel that this fresh design style, combined with the responsive approach to the build, really elevates them from their more traditional competitors and reflects their fresh approach to business. From a content perspective they were keen for the site to feel very dynamic and for projects, blog and thinking articles to form the basis for return visits to their site. 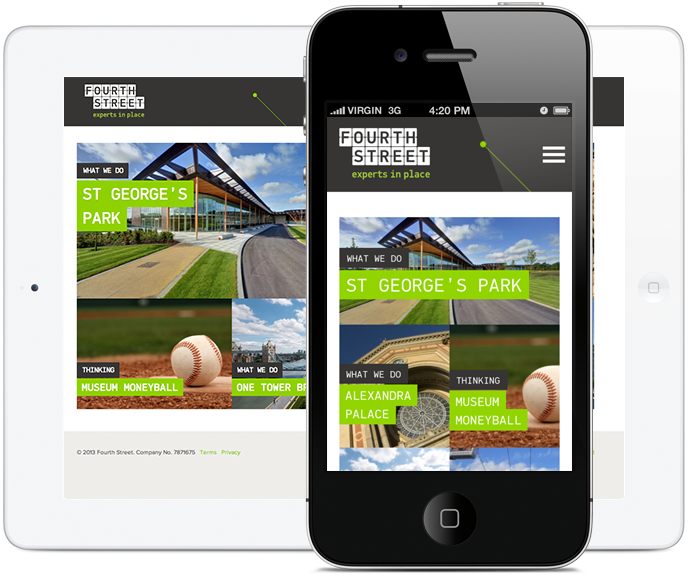 This is all content managed and gives Fourth Street the platform to share their industry knowledge and attract a following as experts within their industry. Play with the site on your different devices, resize your desktop browser, the site is fully responsive! We worked closely with TBWCF throughout the build phase of the project and they've done a splendid job of delivering on our design intentions and fully integrating the content managed areas of the site into Wordpress. We are delighted by the design and functionality of our website which resulted from a fresh and stimulating dialogue with the Supereight Studio team. We were particularly thankful for their ability to work around our changing timetable.